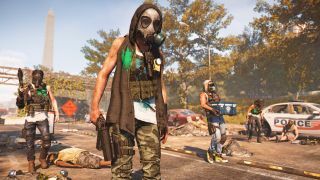 The daily and weekly projects available in The Division 2 have been temporarily disabled, developer Massive Entertainment confirmed. Many projects were awarding duplicate rewards, so they were pulled offline to prevent further accidental duping. The good news is that the removal of these normal projects hasn't affected the special projects tied to the new Division 2 apparel event. For the unfamiliar: players who log in by Thursday, April 11 will receive one free apparel cache containing limited-time cosmetics. After that freebie, you need to complete apparel projects to earn more caches, so it would've been hugely disappointing to see them disabled, especially since the event only runs through May 2. Relatedly, if you now see a message stating the apparel event has ended, just restart your game in order to clear it up. The Division 2 endgame primarily consists of grinding invaded missions and Dark Zones while fleshing out the reworked world map, but completing projects for settlements is still a good source of loot and many essential crafting resources, so it is a bummer to have them disabled. I mean, obviously, right? The duped rewards the bugged projects were dishing out were so over-the-top that Massive held an emergency shutdown over the weekend. As it happens, duplicate project rewards was just one of several bugs introduced in the latest update. You won't find them in the Division 2 patch notes, naturally, but players have reported widespread issues since the release of World Tier 5. In the same post addressing the projects, Massive said it is also looking into one of the more pressing bugs: signature weapon ammo not dropping. Massive hasn't released an ETA on when these projects will be restored. We've reached out to Ubisoft for more information and will update this story as more information becomes available. Strongholds and Dark Zones aside, you'll also want to explore these Division 2 hidden side missions.